Chester Smith was born in Durant, Oklahoma according to his memorial program, but some publications have listed Wade as his birthplace. Wade is a few miles east of Durant. His musical career took him to the central valley of California where he became not only a local music legend, but also a very astute business person. Chester started his long musical journey when he was just seven years old. He was first heard on the air in 1943 over KTRB in Modesto, California as part of a children's broadcast. He began his disc jockey program when he was just 15 years old. He was signed to a recording contract by Capitol Records in 1953. In the middle 1950s, he was being heard over KTRB. His personal appearances saw him entertaining audiences on a regular basis at the Riverbank Clubhouse in the small farming community back then of Riverbank, California - just north of Modesto. Another popular group on the station at the time had a show that preceded his, Maddox Brothers and Rose. Imagine what that must have been like to live in Modesto back then to hear that kind of entertainment on the radio? It has been noted a few times that one person that snuck in to see Chester perform at the Riverbank Clubhouse was Country Music Hall of Famer, Merle Haggard. In a 2002 San Francisco Chronicle article, Merle noted about Chester, "He had charisma." Back then, audiences in Riverbank weren't only seeing Chester. Folks like T. Texas Tyler, Lefty Frizzell, Jim Reeves, Freddie Hart, Jim Ed and Maxine Brown also appeared there. Bill Carter's band was also on the scene. In fact, in one 2001 article, the author noted that Chester had pictures of him sharing the stage with many of the country legends such as Hank Williams and Lefty Frizzell. A 1955 article in Cowboy Songs magazine mentions that those stars used to come to "...Chester's Riverbank Western Ballroom." Perhaps that is the same club that was mentioned previously, leaving us something to research and hope our local library has an old phone book going back to those days. Often buried in the regional columns in many of the old magazines are brief mentions of happenings at local venues that give us a sense of the country music scene back then. Skeets Gardner, of radio station KECC in Pittsburg, CA was one of those columnists contributing to the Cross Country Jamboree that appeared in Country & Western Jamboree. 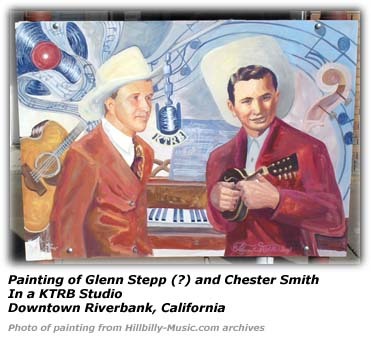 He wrote in May of 1955 that several artists of the day had visited Riverbank, appearing with either Chester Smith and his band or Bill Carter and the Hometown Boys. These included Lefty Frizzell, T. Texas Tyler, Jim Reeves, and Jim Ed and Maxine Brown. 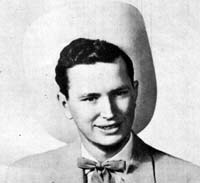 Skeeter Gardner wrote later in 1955 that he was a part of the band that backed Bill Carter, the Hometown Boys. During 1955 they were appearing Thursdays and Saturdays at the Riverbank Club House when they weren't on the road touring. One weekend, they were up in Yuba City, California, and appearing in their absence in Riverbank was Tex Williams. He mentions others such as ALvadean and Sandy Coker, Skeets McDonald, Billy Barton and Wanda Wayne entertained the audiences in Riverbank. In a 2006 article shortly after the passing of one of his muscial friends, Buck Owens, Chester told Roger W. Hoskins, "Buck worked up here one season at the cannery, but I first heard about him from Tommy Collins (another 1950s music figure from Bakersfield)," Smith said. "He told me about his guitar player, that was Buck, and I booked (Owens) up here for the radio station, KLOC." Later, Buck would begin to make a name for himself. Buck and Chester happened to be working in the Napa area and were chatting in between sets. Chester had told Buck that he was tired of the road life and wanted to leave the music and try his hand as a businessman. Buck just shook his head as the story goes telling Chester it was ridiculous for him to quit and that he'd be back. Indeed Chester did return to the music - but it wasn't until 40 years later. Over the years, Buck would often consult with Chester as Buck found that there was indeed money to be made being in the broadcasting business. The two of them stayed friends through the years. In fact, Chester noted in that 2006 article that he knew Buck's mother. She told Chester that his tune, "Wait A Little Longer, Please Jesus" was her favorite tune. Buck sang the tune at her funeral. In 1955, a disc jockey poll voted him the best "New Male Sacred Singer". In 1956, a national publication, Country & Western Jamboree voted him in the top six of Best New Sacred Singers, the top three of whom are all now in the Country Music Hall of Fame - Porter Wagoner, Carl Smith and Sonny James. On his radio shows, a 1955 article noted that he would start his show with the phrase, "Howdy Folks, Chester Smith speakin' at cha." That 1955 article also mentions he had been on KTRB since about 1945. In 1955, he was heard at 7am each morning and 5:15pm in the afternoon, on the air for two hours each it appears. Skeeter Gardner wrote in July of 1955 of a new country music park near or in Riverbank, California called "Shady Oaks Park". The venue was either owned or run by Chester Smith and was appearing there every Sunday with visiting artists to the area. The entertainment would start at noon ad usually run to 6:00pm. Artists who had appeared there included Freddie Hart, Terry Fell, Bonnie Sloan, Jinks (Tex) Carman, Cousin Herb Henso, Foreman Bill and Skeeter himself. One Sunday, the weather turned cool and windy, but they still had a turnout over over 1,000 folks that stayed until 6:00pm. He had quite a band back then. Grover Jackson was on the electric guitar; Dean Manuel was on the piano. Hazel Houser was playing rhythm guitar and doing harmony duets with Chester. Hank Stollins was on drums. And Barbara Brake was on fiddle. In 1955, he added Curley Reeves from North Carolina to his troupe. In 1956, a small biography of Chester (a magazine devoted its coverage to the Capitol Records label in one issue) notes that he was receiving 500 pieces of fan mail each week. He also owned two drive-in restaurants and had moved to a peach ranch with his then wife, Naomi, in the Modesto area. Our research also shows that sometime around 1955 or 1956, Del Reeves joined the cast of Chester Smith's show when it aired from Sacramento to gain some television experience after Del finished his stint in the military service. In 1957, Rustic Rhythm reviewed one of Chester's new Capitol Records releases and we find a little nugget that you might find of interest. On the flip side of "There'll Be Other Times", he did a duet number with Del Reeves called "One Life To Live" and the magazine reviewer thought they pulled it off pretty well. Country & Western Jamboree magazine's review of recordings back in the 1950s seemed to be a bit more blunt or honest in their assessment compared to the gushing reviews of the modern era. They found his 1957 release a bit lacking. They thought he had the talent, but they were feeling the material wasn't helping reach his potential. In 1957, it was reported that he had a show over KFRE-TV in Fresno every Sunday afternoon and on KCRA-TV in the state capitol city Sacramento on Saturdays. His fan club was headed up at one time by Mrs. Sandra Odem in Ione, California. He bought his first radio station in 1963, perhaps following the same path of his idol, Gene Autry, who also started out as a singer and acquired his own businesses such as radio stations. That station was KLOC in Modesto. He sold KLOC around April of 1981 to Armour C. Smith who was president of the new owner group and then was the owner of the May Transfer and Storage Company. Chester continued to own a television station in Modesto, KCSO-TV, channel 19. Around that time the FCC had instituted a new policy that one could not own both a radio station and television station in the same market. The television stations he started were sold to Univision and it was said his stock was worth about $45 million after the sale. Though when that sale was going through, it perhaps almost literally killed him, having to deal with so many lawyers and accountants at the time, putting him into a coma, but he came out thinking, what else does God want me to do in this life? In 1996, his television empire continued to grow and reach for new markets. He started KNSO-TV that was to bring Asian programming to the central valley from Porterville to Sacramento and was affiliated with the Lincoln Broadcasting company in San Francisco. The station was to feature programming in Japanese, Filipino, Hmong, Vietnamese, Cambodian, Cantonese, Portuguese, Laotian, Hindi, Mandarin, Grecian and Italian. The station was to be picked up by the various local cable television companies as well and was broadcasting over channel 51. However, the Asian and Christian programming that was the origin of channel 51 appeared to have been a short-lived attempt. In December of 1996, the Harry Pappas had the rights to air the WB broadcasts in Fresno, but had lost its contract with KGMC. He had been talking with Chester Smith to have the programs move to KNSO-TV which was located in Merced. Those talks had started as early as September of 1996. One sticking point Chester noted was what to do with the Asian programming; the article notes that Chester would have to buy out the remaining 19-months of that contract. In June of 1997, the Pappas broadcasting company announced an agreement with KNSO-TV to lease eight hours a day for a new network's broadcasts, WB. They were to have the 3:00pm to 11:00pm timeslots. The agreement became necessary for the Pappas group when they were unable to come to terms with KGMC in Fresno to renew their contract in a similar arrangement. Channel 51 continued its religious programming, but the Asian programming had ceased a couple of weeks prior to the final agreement with Pappas. In the midst of working his contract with Harry Pappas in 1996, Chester was negotiating an even bigger deal for another of his stations, KCSO-TV, channel 19. The station was the only Spanish-speaking station from Marysville to Merced. An October 1996 article in the Sacramento Bee notes that Chester sold the station to Univision for $40 million. The 2002 article notes he was living in a 25,000 square foot mansion on 156 acres that fronted a river. He also had a cattle ranch in San Andreas and homes in Carmel and Beverly Hills. It was during a visit to his station in Redding, California that he took time out to have lunch with a friend named Merle Haggard and talk about maybe completing the musical chapter in his life. 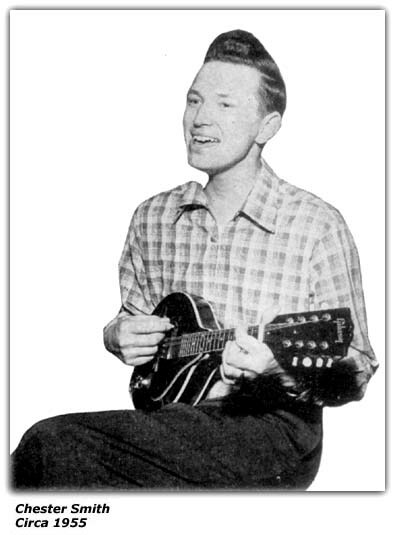 Merle offered him use of his studio and Chester went in and did a session or two that included Merle accompanying him on several of them, including a memorable rendition of the Roy Acuff classic, "Wreck on the Highway". In October of 2002, the Wall Street Journal reported that NBC had acquired a Fresno television station from Sainte Partners in a package deal for that station and two others in Arizona for its Telemundo subsidiary for a total of $52 million. NBC had acquired Telemundo in 2001 for about $1.98billion and $700 million in debt in an effort to compete with the Univision network for the Spanish-speaking market. Tim Moran wrote in the local Modesto Bee that the station, KNSO-TV, channel 51, was sold for $33 million. The Arizona stations were KDRX in Phoenix and KHRR in Tucson. The story notes that the sale of the station was a family decision as his daughters owned a share of it. His business acumen in the television industry earned him an award as broadcaster of the year by the California Broadcasters Association during their 56th annual convention in 2003. Ms. Rowland of the Modesto Bee noted that instead of the usual acceptance speech for such awards, Chester stayed true to who he was ... he sang the crowd a gospel tune. In the audience were such notables as then Lt. Governor Cruz Bustamante, Barbara Eden and Alex Trebek. The awards and recognition continued in 2003. In November of 2003, he was recognized by the Latino Community Roundtable as one of the awardees for their Outstanding Latinos in 2003 for his contributions to the community with his Spanish-speaking television stations. The honorees were to be feted at the organization's second annual Feliz Navidad awards banquet and dinner-dance in December of 2003 in Modesto. In 2006, the central valley was struggling with how to deal with the new type of night life called the hyphy, which at times resulted in some rowdiness and arrests and extra police efforts. That prompted Mr. Hoskins of the Modesto Bee to reach back in time when Riverbank was going through something similar in the early 1960s in its Roller Rink and also what was known as the Riverbank Clubhouse. The article notes that the police said those two venues were responsible for 25% of the crime and over 220 arrests in 1961. Mr. Hoskins talked to Chester for his story about what it was like back in the early days at the Riverbank Clubhouse. Chester told Roger that the venue was at first a lodge, but they had trouble getting a crowd. So, the owner at the time, William McDonald, approached Chester who was a local radio and performing star in the 1950s in the area to see if he could help draw a crowd to the hall they had. Indeed, they began to fill the seats, charging admission and were just serving beer at the bar. You've seen previously the type of performer that appeared there. Chester noted they had a big sign in front the Clubhouse: "Keep Out If You Don't Want To Have Fun". Chester said the venue was very popular and was a money-making operation. He sold it to Merle Schulz in 1959 or 1960. Mr. Schulz was a mayor of Riverbank as well at one time. Chester noted that they had their share of rowdyism. Crowds would come from as far away as the Bay area. He told Mr. Hoskins, the club had their own clean up crew and had the city cleaned up before folk awoke on Sunday mornings. But around 1961 or 1962, there was a shooting which caused an uproar. So, the city tried to regulate the Roller Rink and the Clubhouse by banning dancing after midnight, but left a loophole that allowed the members of 'private clubs' to continue their night out until 2:00am. The ordinances seemed to have had the effect, though local ministers thought it was inadequate. The rowdyism was reduced. But so was the attendance at the Roller Rink and the Clubhouse. Both eventually closed. Riverbank's reputation as "Dancing City USA" was no more. In April of 2008, his friend Merle Haggard came to Modesto, California to perform at the Gallo Center for the Performing Arts. Merle got a rousing ovation from the crowd when he introduced Chester to the audience then. In the summer of 2008, Chester took ill and it took him to a hospital in Palo Alto, California for treatment. He died there on August 8, 2008. 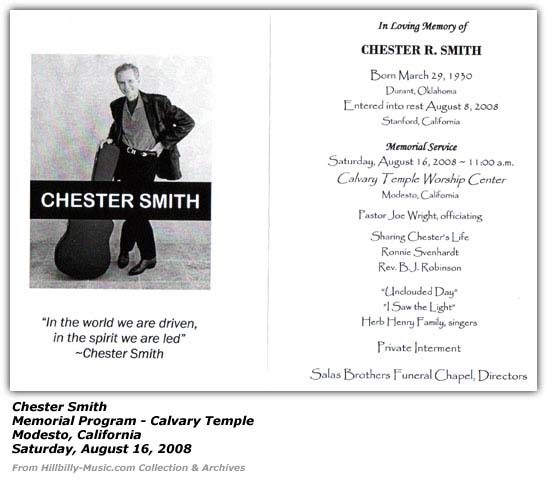 A memorial service for Chester was held at the Calvary Temple in Modesto, California on Saturday, August 16, 2008. Pastor Joe Wright officiated over the service and included testimony by Chester's friends Ronnie Svenhardt and the Rev. B. J. Robinson. We attended this service. About 500 people showed up, many near Chester's age - a recognition of those from his generation who knew him through the years and quite a few of the younger generation as well. Mr. Wright told of a story about Chester's early life in his family. Chester was the youngest of six children in the family. His mother was a religious person and wanted to instill that same spirit in her children so they, too, would be saved. Chester took to music at an early age, learning to play the guitar and singing. His mother told him, perhaps prophetically, "You won't amount to anything unless you sing about Jesus." Perhaps it is fitting that his biggest hit was "Wait A Little Longer, Please Jesus", a tune that has been recorded by over 100 artists. The Herb Henry Family singers then did one of Chester's favorite gospel tunes, "Uncloudy Day", getting the crowd to clap along with their harmonious rendition that is typical of the traditional country music format. Next up to the dias was Ronnie Svenhardt, a long-time friend of Chester's. He talked of knowing Chester as a Christian business man. He knew him as an astute 'negotiator', remembering that Chester once mentioned he always felt he left something on the table when he wrapped up a deal. Ronnie spoke of the religious nature that Chester carried with him, citing the quote we saw in his memorial program, "In the world we are driven, but in the spirit we are led." He noted that Chester was now in a place where there is "...no more pain, no more sorrow." We learned from Pastor Wright that Chester was offered a movie contract, offered a job if he moved to Nashville. But Chester was a driven person in one regard, he wanted to be the master of his destiny. He never collected a paycheck from anyone - he supported himself and through his thriving businesses, wrote the paycheck for others. He owned the first country music radio station in northern California. He then moved into television. Mention was made during the services more than once and in news stories at the time of his death of starting a string of Spanish language television stations. They noted he saw a lot in common with the migrant workers he saw in the farm fields in California to the folks who toiled the fields in Oklahoma before the dust bowl era. It may be the stations were Spanish-speaking, but in another sense, he was providing a bit of relief and entertainment to those folks who were doing the hard labor, a chance to relax and forget their aches and pains from a long day of labor. He eventually sold those stations to Univision. The Herb Henry Family Singers then did another of Chester's favorites, the old Hank Williams standard, "I Saw The Light". Pastor Wright noted after that tune, when that song first came out - it resonated with many because they needed to hear that message. The Rev. B. J. Robinson came to the dias and spoke fondly of his times with Chester. He noted long ago that he had noticed that Chester was kind of sad at one point, perhaps depressed. But when he saw him a few weeks later, he was glowing, smiling and quite a changed person. When asked what caused this change, Chester just smiled and said, "I"m in love." Was it the love for his first wife? Or was it that he had found another calling in his life? We then got to hear Chester's version of "Wings of A Dove", which included a bit of a recitation piece between verses pointing out the significance of the 'dove' and it's uniqueness. We learned how Calvary Temple acquired the property it was currently on. It seems that because of Chester's association with the radio station that owned the property at the time (perhaps this was KTRB), that if the station ever decided to sell the property, they had to sell it to the church. But the church was not that well off back then when they were approached about the sale of the land. They asked the church - how much will you pay? And they gave their amount. And then they asked, how do want to pay for this? They told them they'd pay about $10,000 first. Then asked if they could wait another five years before beginning to pay the rest. The deal was made. A video tribute was a welcome treat during this service. We got to see Chester perform a bit. During a Grand Ole Opry anniversary celebration, Merle Haggard introduced Chester to the Opry audience so they could do a duet on his tune, "Wait A Little Longer, Please Jesus". Chester wryly noted that it had taken him 40 years to finally get to sing on that stage where his idols such as Roy Acuff had performed. Another snippet included Chester doing a tune as part of a FOX network tour of sorts for Fox affiliates. It had an American Idol background, Ryan Secrest, host of the popular show, introduce Chester to the audience who did one of his tunes as he could only do. Chester seemed to have this way of holding his guitar aloft and picking an instrumental interlude between verses. We got to see him do a seemingly recent studio session caught on tape, an interview that allowed him to talk about his life briefly, then we got to hear him and his wife do a nice duet number together, "Let's Be Young Again". Finally, the lights came back up and we got to hear Chester and Merle do one more time, Chester's classic tune. It was said that Chester was happy during his last days, unafraid of death, knowing that he would be in a better place. It was said that he was the lucky one - he had beat us there and was waiting. The local Riverbank, California newspaper noted that Chester lived on his ranch for many years just north of Riverbank on the opposite side of the Stanislaus River. He stayed in touch with his local roots - he had donated nearly $10,000 to help get the community pool built. He helped promote the city's "Festiva Latina" during the years he owned his television station. The local newspaper article recounted a story from the Riverbank Historical Society member, Preston Tucker. Chester had a friend whose family also migrated from Oklahoma. They worked together in a 'drying yard' but every day at noon time, Chester would drag out his guitar and play throughout the lunch hour. Chester was awarded the Modesto Area Music Association's lifetime achievement award in 2002. He also won a Pioneer award from the Christian Country Music Association. "Smith, who holds hands and asks blessings over lunch, is still a small-town man, a throwback to a simpler time. Anachronism or not, he is making his way back to the music scene on his own terms. He may be a rich man who drives a Rolls-Royce, but Smith earned his money the old-fashioned way. "No one should shame Chester for doing well," Haggard said. "He's a great hero, and we're short of them today.""